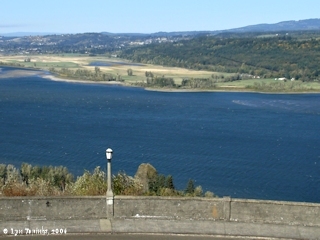 Click image to enlarge Steigerwald Lake NWR, Washington, as seen from Crown Point, Oregon. Early explorers and traders called the area of Washougal and Steigerwald Lake "Tea Prairie". Image taken October 21, 2006. Early fur traders called the Washougal and Steigerwald Lake National Wildlife Refuge area "La Prairie du The", or, "Tea Prairie". The traders use to stop to pick a form of wild mint that became a substitute for tea. 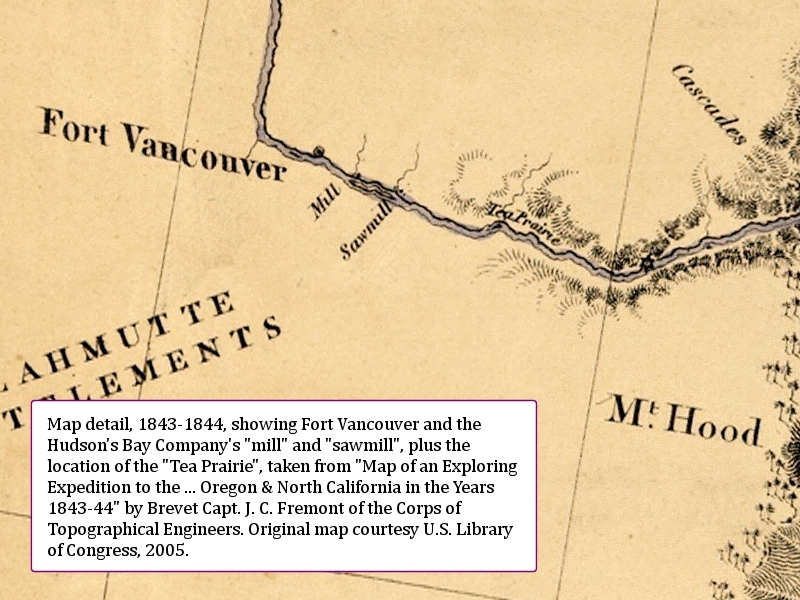 Presumably John C. Fremont's "Tea Prairie river" is the Washougal River. Lewis and Clark first passed the prairie of what would become "La Prairie du The" or "Tea Prairie" on November 3, 1805, on their way to the Pacific. Clark wrote about the prairie while near the mouth of the Sandy River. On their route maps [Moulton, vol.1, map#79 and map#88] they label the area of today's Steigerwald Lake NWR as "Prairie". On their return the men camp for six days on this prairie, a camp now known as Cottonwood Beach. The "Seacalf river" is today's Washougal River. The route maps show their camp to be on the east side of the area they labeled "Prairie". The first use of the name "Prairie du The" or "Tea Prairie" that this web author could find was in explorer Ross Cox's journel entry of April 21, 1817 (published 1832). "... On the 21st we arose with the dawn, and embarked. Some of the canoes having struck on sunken trees, we were obliged to put ashore for a couple of hours to repair the damage and dry the goods. We encamped at dusk about five miles above La Prairie du The, so called by the Canadians from a species of mint which grows in it, and which they are fond of using as a substitute for tea ..."
Source: Ross Cox, April 21, 1817, published 1832. "Thursd 30 This Morning Mess. Black & Annance Came back with Thomas & Crew with 14 Ps of the property picked up from the confined Eddy at the Portage a great intermixture of baggages took place the Whole baggages were Examined to ascertain the Pieces lost with an account of which M' Annance with 16 men will be dispatched to Vancouver -- will take the Boat which was found below Tea Meadow [Prairie du The] also in order to come up lighter & mor Expeditiously -- Wrote to C.F. McLoughlin informing him of the sad events and requesting that the Pieces of which a list is sent May be replaced as it would bear very hard upon the Posts for the trade during the season ..."
Source: Chief Factor Peter Warren Dease, June 30, 1831, Journal of the Brigade from New Caledonia to Fort Vancouver and Return, 7 May - 13 September 1831, IN: James R. Gibson, 1997, The Lifeline of the Oregon Country: The Fraser-Columbia Brigade System, 1811-47, in reference to a boat being damaged while trying to navigate the Cascades. Nathaniel Wyeth organized and led two expeditions to the fur country, hoping to establish a good trade. He spent time in the Columbia River area between 1832 and 1836. In 1834 Wyeth established Fort Hall (the location of today's Pocatello, Idaho), and in the spring of 1835 he briefly established Fort William, a trading post on Sauvie Island, Oregon. In Wyeth's two journals, one from his first expedition in 1832 to 1833, and the other from his second expedition from 1834 to 1835, Wyeth mentions "Prairie du Li", "Lea Prairie", and "Tea Prairie". "... 31st to the 3rd. Feb. we had warm and wet weather on the 3rd at 10 ock. we started for Wallah Walla I had with me two men and am in company with Mr Emmatinger of the H.B. Co. who has in charge 3 boats with 120 pieces of goods and 21 men. I parted with feelings of sorrow from the gentlemen of Fort Vancouver their unremitted kindness to me while there much endeared them to me more so than it would seem possible during so short a time Doct McGlaucland the Gov. of the place is a man distinguished as much for his kindness and humanity as his good sense and information and to whom I am so much indebted as that he will never be forgotten by me this day we came to the Prarie Du Li[s] 15 miles raining most of the day. Source: Nathaniel Wyeth, January 31 to February 5, 1833. "17th. Took the gig and went up to Tea Prairie to see about a location but found none." Source: Nathaniel Wyeth, September 17, 1834. "... At 11 o'clock next day we arrived at the cascades, where we made the long portage, and at nine in the evening encamped in an ash grove, six miles above Prairie de The. On the 8th, reached Vancouver ..."
"... To return to our immigrants. On leaving the Dalles they proceeded on down the south side of the river as far as practicable, or opposite to the Wind Mountain. At this point the Indians assisted to cross them over to the north side, when they again made their way along the river as far as Tea Prairie above Vancouver. ..."
Source: Francis Fuller Victor, published 1877, Eleven Years in the Rocky Mountains and life on the frontier, "Down the Columbia", Columbian Book Company, Hartford, Conn., writing about September 1840, Robert Newell and Joseph L. Meek wagons journeying to the Willamette Valley. In 1843 Captain John C. Fremont, of the U.S. Exploring Expedition, led his men down the Columbia River to Fort Vancouver. His goal was to link his survey of the west with that of Captain Charles Wilkes, who reached the Columbia in 1841. While Fremont doesn't mention "Tea Prairie" in his text he does mention the "Tea Prairie river", presumably today's Washougal River. 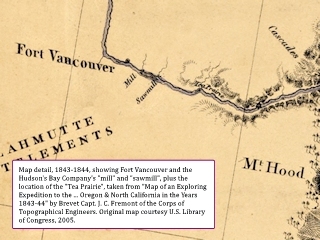 Fremont's map of the expedition however has "Tea Prairie" labeled over an area stretching from today's Camas and Washougal on the west to the eastern end of the Steigerwald Lake National Wildlife Refuge. 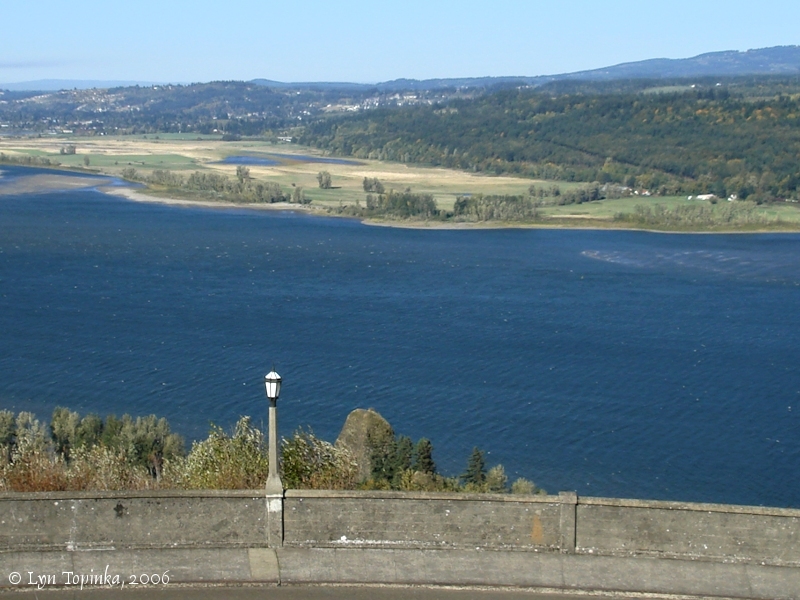 Fremont shows a river entering the Columbia just behind an unnamed island. This matches the location of the Washoughal River and Lady Island. "As we advanced, the hills on both sides grew constantly lower; on the right, retreating from the shore, and forming a somewhat extensive bottom of intermingled prairie and wooded land. In the course of a few hours, and opposite to small stream coming in from the north, called the Tea Prairie river, the highlands on the left declined to the plains, and three or four miles below disappeared entirely on both sides, and the river entered the low country." Source: J.C. Fremont, November 7, 1843. "... As the employes of the fur companies completed their terms of service or grew too old for the strenuous life of the mountain and portage, they set up house-keeping in semi-Indian style on some spot the trapper had selected during his time of service. Tea Prairie, French Prairie, Tualatin and Clatsop Plains were cheerful openings in the pervading forest, and selected as homes by settlers as early as 1830. ..."
Source: John Gill, 1908, "On Clatsop Plains", IN: Sunset Magazine, vol.20, no.3, January 1908. U.S. Library of Congress website, 2005.